I guess there is nothing left to believe in. It was a great Cinderella story that year and now it is ruined. Who Did Yankee Opponents Have To Fear In The Late Innings During The Late 1970s? A couple of weeks ago on a White Sox game, Ken Harrelson said something like "back in the late 70s, when you were facing the Yankees, Reggie Jackson wasn't the guy you had to worry about. Other teams worried about Munson and Piniella in the late innings." So I looked at how each of them hit in innings 7-9 from 1977-79 using Baseball Reference. 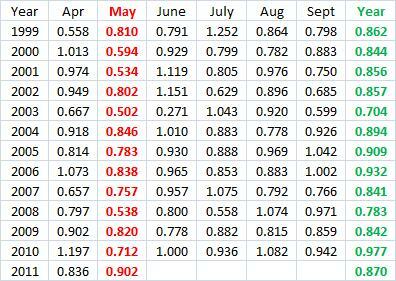 The table below summarizes the data. If you were afraid someone would get a hit, Piniella was the problem. But if power was the concern, Jackson was still definitely the guy doing the damage. 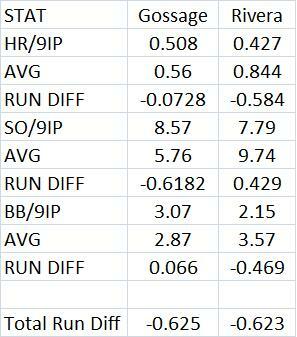 And his average was not much lower than Munson's. 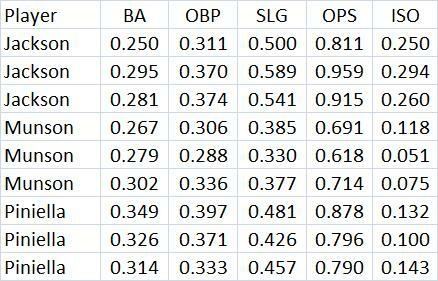 Notice that if you add up the isolated power of both Munson and Piniella it is still less than Jackson's, meaning that he had more extra bases per AB than those two combined. The PA minimum was 400. 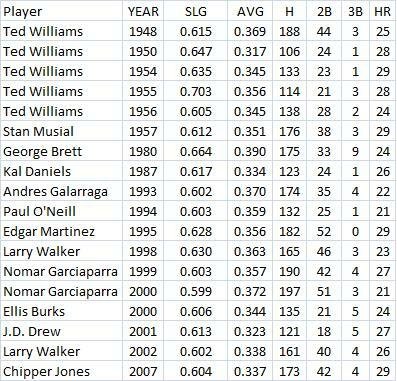 This is inspired by “Roll Projector!” Jose Reyes *is* on an Historic Pace from the Baseball Reference blog. They mention that Jose Reyes has a chance to set the Mets record for total bases in a season without hitting many HRs. The table below shows all of the players who fit my criteria. Those all happened a long time ago. 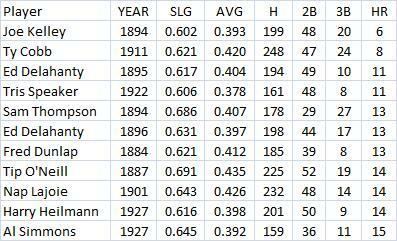 The table below shows all the players who did it since 1946 with less than 30 HRs. The NL is averaging 3.89 runs per game with a .689 OPS. Their ISO is just .125. The AL is scoring 4.16 runs per game with a .712 OPS and a .139 ISO. Data from Baseball Reference. These numbers are even lower than they were in April and May. See my earlier post May Hitting About As Bad As April. Last night there were 7 games with a total runs scored of 5 or less. That is between both teams. In 98 games so far in June, the NL has hit just 73 HRs. That would be about 120 per team for a whole season. The AL was a little better with 82 HRs in 88 games. 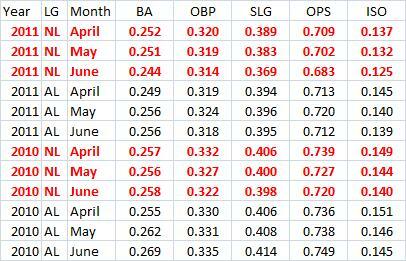 The table below shows the hitting stats in each month for both leagues in each of the last two years. The June numbers for 2010 are for the entire month. The next table shows how each of those stats has changed. Not sure if there is any kind of pattern other than that everything is down. 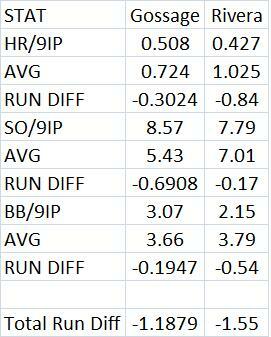 It looks like the NL's power decline is even bigger than the AL's when you look at ISO. The MLB OPS for each month was .711. The NL fell to .702 from .709 while the AL rose to .720 from .713. But each league saw runs per game drop off. The AL went 4.33-4.29 while the NL went 4.25-4.02. Isolated power fell just a bit in each league. The AL declined from .145 to .142 while the NL slid to .132 after .137 in April. The run scoring was probably helped over the last two days of the month which had 5.28 per game for all of MLB. 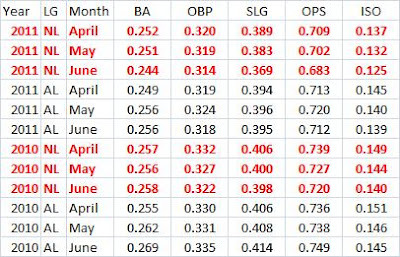 I looked at April vs. May hitting a few weeks ago with May Hitting So Far Has Been Even Worse Than April Hitting and May OPS: AL .705, NL .699. I also noted, as so many others have, that Albert Pujols is off to a slow start. See Albert Pujols' Slow Start from May 23. His OPS+ in each of the first two months so far have been 112 & 113. It is the first time in his career that he has had two straight months under 120. He has only had under 150 in back-to-back months twice before this and never had back-to-back months below 140. In 48 of his first 60 months his OPS+ has been 150 or higher. His ISO in May was .099, well below the league average of .132. Paul Konerko had the highest May OPS of his career, .902. The next highest is .846. So given that hitting is down in MLB this year compared the rest of his career, this is pretty interesting. In fact, Konerko's May OPS in every year of his career has been less than the full-season OPS. See May Day, May Day! Throw Konerko A Life Preserver. So it looks like he has overcome his May jinx. 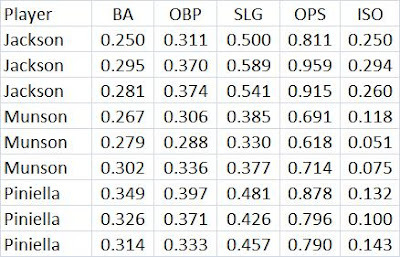 The table below shows his OPS in every month starting in 1999. April actually includes March and Sept includes Oct. In only 3 seasons has his May OPS been greater than his April OPS (1999, 2007 and 2001). In only 3 seasons has his May OPS been greater than his June OPS (1999, 2003, and 2009). In six seasons his May OPS fell by 100 or more points compared to April and then rose 100 or more points in June compared to May. In six seasons his overall OPS was 100 or more points better than his May OPS. Three others were 50 or more points better. The closest his May OPS has gotten to his full season OPS is 22 points. He has had 8 months with an OPS under .600 and 4 of them have come in May. No other mont has more than one and the one from Sept was .599. Going into this year his career May OPS was .713. So he beat that by nearly 200 points.